Showcasing my EdinburghSketcher merchandise across the city on two wheels. Today I was delivering merchandise to a few shops, Concrete Wardrobe on Broughton Street, ICE retail in the St James Centre and Looking Glass Books in Quartermile near the Meadows. I find the best way to speed around the town centre is on two wheels, so I loaded up the panniers and took the racer into Edinburgh. After climbing from the coast to George Street I needed a wee break, so I sat in the sunshine outside the coffee bar in St Andrews Square. 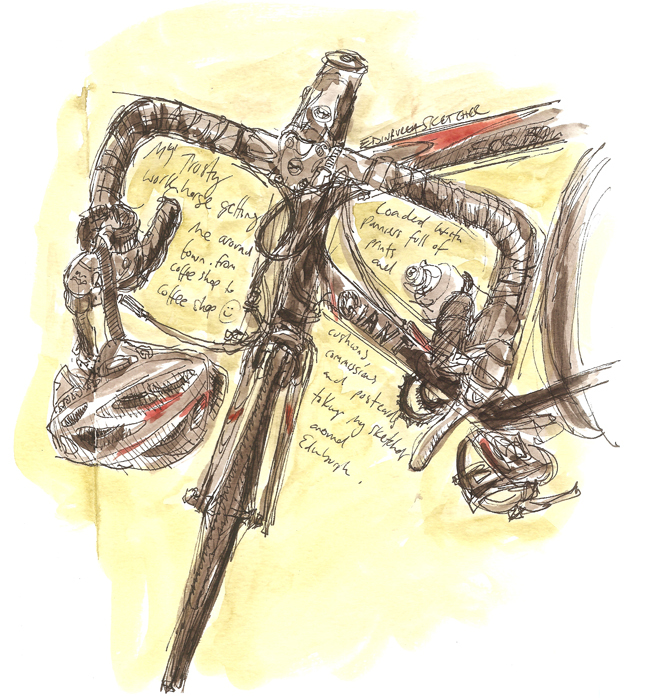 One Americano later and I had sketched this pen and watercolour drawing of my workhorse. Frances Mitchell liked this on Facebook. Valerie Nicol liked this on Facebook. Robyne Ridge liked this on Facebook. Mark Bolsover liked this on Facebook. Moira Eadie liked this on Facebook. Emma Gapper liked this on Facebook. Amanda Hudson liked this on Facebook. Caroline Taylor liked this on Facebook. Sara Marshall liked this on Facebook. Jessica Kirk liked this on Facebook. Vicki Bonsignore liked this on Facebook. Steven Robertson liked this on Facebook. Georgia Watson liked this on Facebook.